The night before, refrigerate the can of coconut milk upside-down over night and assemble the chia seed pudding. Combine the coconut milk, chia seeds and coconut sugar together in a small mason jar, cover, shake, and leave in the fridge over night with coconut cream. The next morning, scoop out the coconut cream from the can (you can save the coconut liquid to add in smoothies later!) and mix thoroughly with the cocao and carob powders, agave, vanilla and almond extracts to make vegan chocolate mousse. Last, layer up the parfaits! 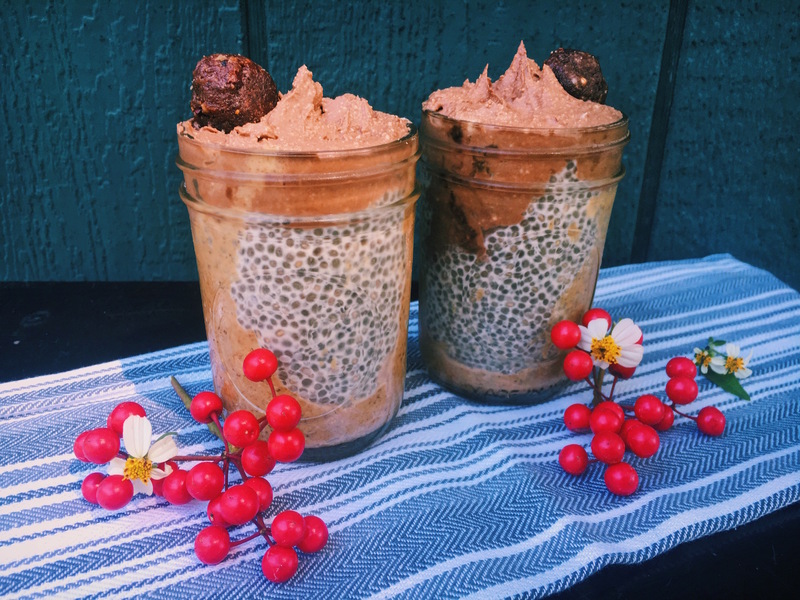 In two small mason jars, add a tablespoon of nut butter into each one, then the chia seed pudding, and lastly the vegan chocolate mousse. Top with whatever you'd like, enjoy!